Commercial airliners are struck by lightning on average once a year. The aircraft body needs to be able to resist the high temperatures associated with the strike, while the onboard electronics need to be immune to the high currents and fields. The rise of lightweight composite materials such as carbon fiber in place of metals increases the complexity of lightning-safe design, since composites are poor conductors and do not provide much electric shielding. Testing a full-sized aircraft for lightning safety is extremely expensive and, if a problem is found, correcting it can be even more costly. Scaled-down models are cheaper but don’t always respond to electric fields in the same way. Result of a lightning zoning simulation. Red shows the areas of the aircraft most likely to be struck. 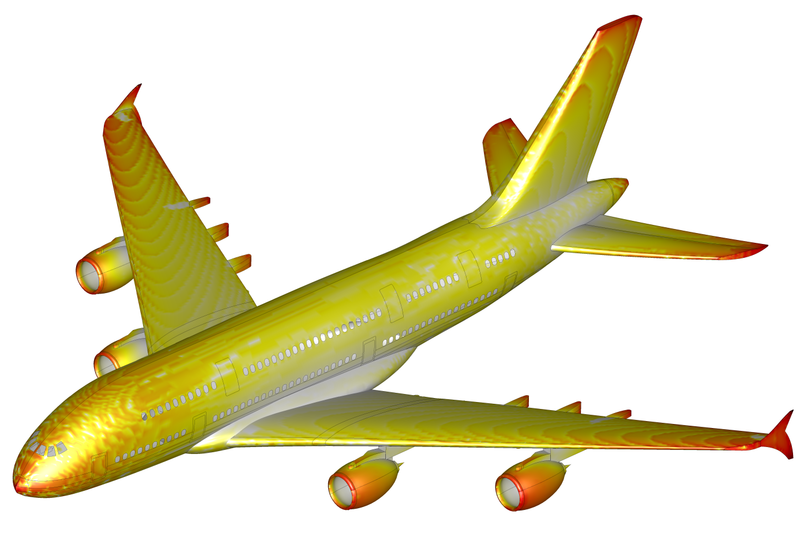 Virtual testing using electromagnetic and multiphysics simulation allows engineers to investigate the behavior of the aircraft under a variety of scenarios and to see the effect of design changes on electric currents and fields, without the hefty costs associated with physical prototypes. Starting with a basic design, lightning zoning analysis can be performed to calculate where lightning is most likely to attach to the body. Time-domain simulation can then simulate the entire lightning pulse in detail, showing how currents propagate over the surface of the aircraft. Tiny details such as seams and wires can provide routes for currents to penetrate the fuselage, making their modeling and simulation critical. The calculated currents and fields can then be used as the basis of a thermal simulation to evaluate how much the materials heat up during the strike. This new whitepaper shows how electromagnetic and multiphysics simulation with SIMULIA software can supplement the aircraft design and certification process and reduce the risk of costly and time-consuming changes late in the development process.